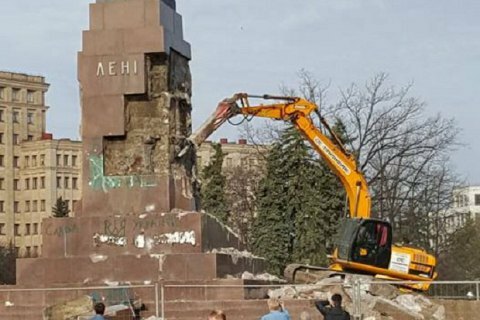 Kharkiv's utility services began dismantling the pedestal of what used to be the largest in Ukraine monument to Lenin. Currently, the pedestal is surrounded by a fence. A spokesman for the city authorities said it was impossible to say exactly how long the works will take because "the inside structure of the pedestal is unknown". On September 28, 2014, the monument was torn down during a massive rally in the city centre. On the same evening, the head of the Kharkiv oblast, Ihor Baluta post facto issued an order to dismantle the statue. In 2016, Kharkiv city council allocated 1.7m hryvnia for the dismantling of the pedestal.